Stop thinking in a linear manner. Lead generation is different than data mining. Rivette Marketing Group can custom design a program by which you cooperate with others to produce valuable leads for direct sales. Not all leads are alike. That's why companies can charge from pennies to several dollars per name. Leads should be qualified. And the best way to achieve that goal is to prepare the foundation to acquire quality leads. When you want to start thinking in a lateral form, call Rivette Marketing Group. We will have ideas to get you the leads you need. However, be prepared for unconventional thinking. Sometimes the round route is the better route home. In the case of quality lead generation, it can be the only route home. 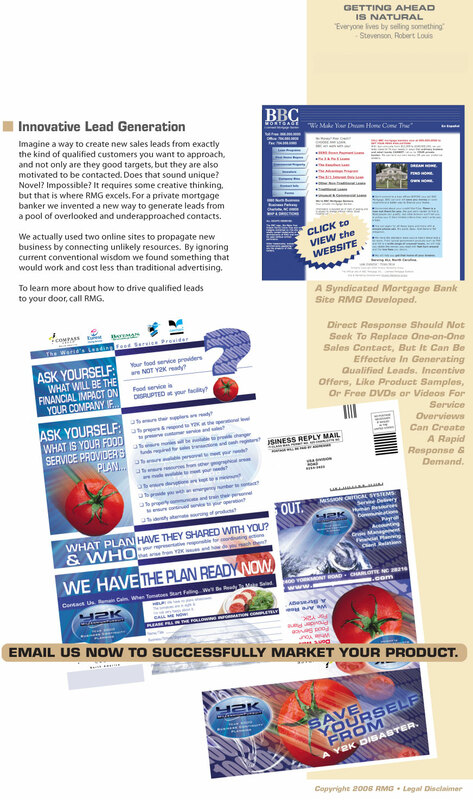 RMG - we can brainstorm projects to bring you leads that propel your sales. Call us as our specific ideas create tangible results.